Google announced earlier this week they would be shooting high-resolution aerial photos in the Sydney Harbour area during Australia Day today. The Sydney Morning Herald reports that they saw many people all over town setting up to be in the picture. 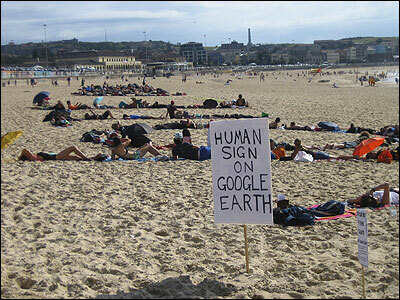 Many of the people were putting up banners, drawing signs in the sand, or laying people out to spell words hoping their words would be immortalized in Google Earth/Maps in a few weeks after Google processes the images. 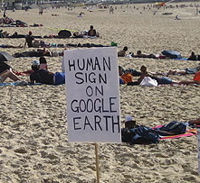 The article includes photos of several of the signs and groups participating. One guy put out a sign saying he loved his wife (who left him recently), and there are many other tales in another article in the newspaper. The first article pointed out that there are rumors Google did this in response to Microsoft doing an aerial photo shot on the same day. Whether or not this is true, the spontaneous response by people coming out for the Google photos was large. The authors of the article didn't mention anyone having seen the plane flying over. I'm trying to get confirmation from Google that the plane managed to acquire photos. I hope they did, this will be really interesting to see if the photos get published. As feared, the photo shoot did not go as planned. The Sydney Morning Herald reports that the plane Google hired was unable to get approval for the flight plan it had filed and it did not fly in all the locations or at the times Google had announced. So, many of the people who had arrived did not get their photos taken as planned. As mentioned last week, holding an aerial photograph as a PR event is very risky. Maybe backup plans such as aerial drones and kite aerial photography could be used to help increase the probability of success for events like this. What's the big deal about being in a photo? Don't we all have loads of photos of ourselves and others stored away in digital cameras and CDs that will never get processed?! www.aerialphotographyforyou.co.uk show exactly what can be done with a balloon and a camera.